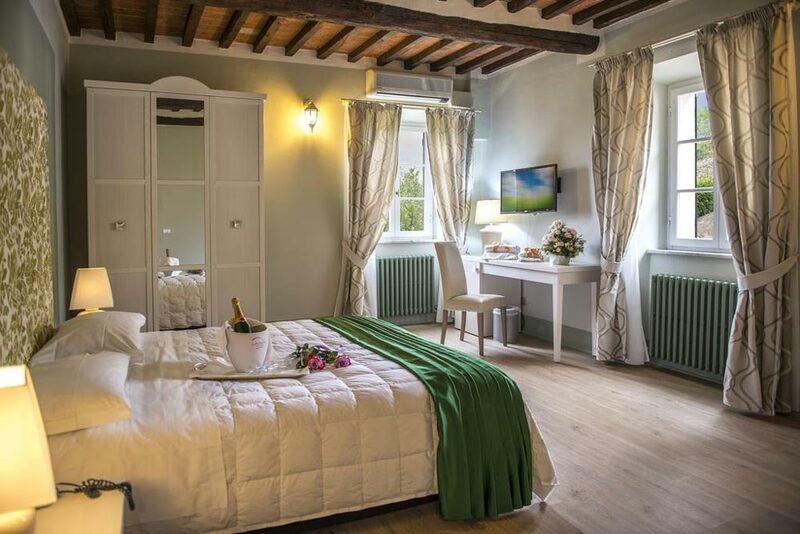 Villa Aurea accommodate 12 Tuscan neo-classic and luxury rooms. They are our Deluxe Rooms, designed to provide our guests with maximum comfort and an elegant and exclusive atmosphere. Villino rooms are a highly refined and charming countryside luxury. Among these rooms is our Junior Suite “Acqua Aura” equipped with all comforts such as couples’ hydromassage tub and sauna-effect shower. To those seeking privacy and comfort, we recommend the environments of Limoniaia: our rooms named denominate Garden are spacious, welcoming and featuring an independent entry with a delicious private garden. In this building, our “Zircone” Junior Suite, able to welcome guests into a warm atmosphere of wellness, luxury and unique comforts stands out! All our rooms are designed to offer a high-quality stay; we pay lots of attention to our Guests taking care of their rest which is why every room are en-suite with new and ultra-comfortable king-size beds with sommier, mattresses and pillows specifically designed by “Idormibene”, a Tuscan long-established business. Rooms also come with air conditioning and heating, a direct dial line, a safe deposit box and a well-stocked mini bar.